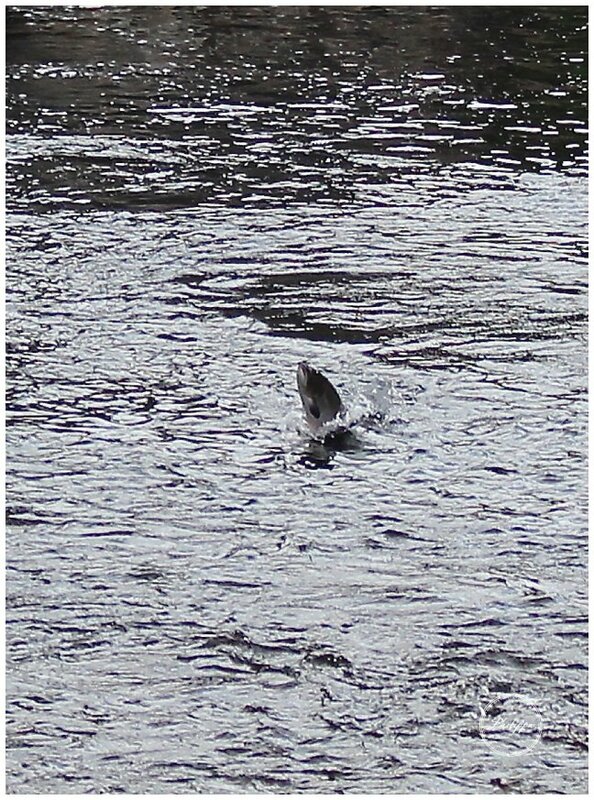 The wild salmon and I were both caught leaping for joy at the prospect of spending some jolly time on the river Findhorn, though clearly with very different motives. 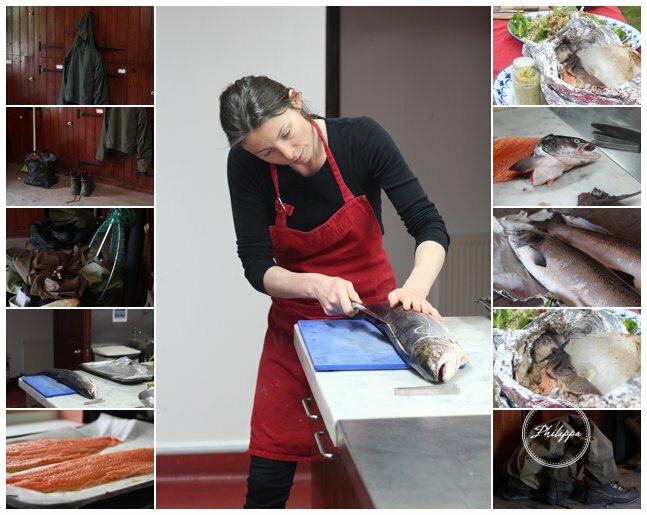 My annual journey to the Highland river banks to cook for these fisherman is undoubtedly one of my favourite jobs. 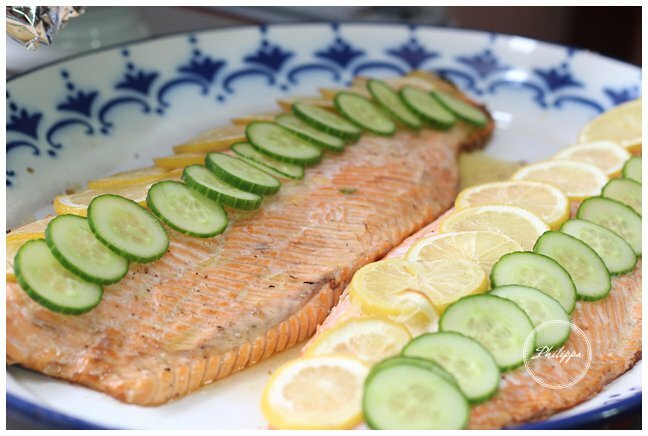 Not only is the setting outrageously pretty with the wild flowers and sparkling, ever changing river and the company fascinating for various reasons but in my opinion there is nothing that comes even close in salmon perfection as cooking and eating the Scottish wild variety. Its texture, colour and above all flavour cannot be beaten. Like a child impatiently waiting for Christmas morning I can hardly bare the wait until I am handed the first one and there is such poetic beauty in knowing it was hatched, matched and dispatched in pretty much the same spot. 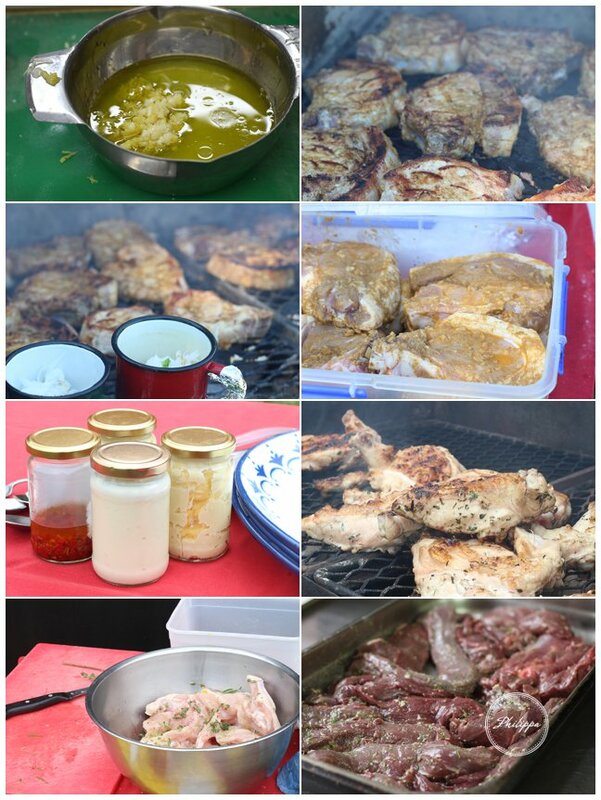 Cooking for a fishing party often seems much more relaxed than other field sports jobs I do as daylight hours are less scarce and timings do not revolve around an army of others, the number sometimes required for a days shoot is something to be seen! I noted my fishermen this year clearly felt very relaxed and I had to restrain myself from shooing them out of the lodge in the morning to maximise their time on the river bank and therefore increase the chances of them bringing me back a salmon to cook with. ‘Extra bacon and sausages for those slipping in a pre breakfast fish” I joked ( but not really) as we got to day two and no one had bought me back so much as a story of how they wrestled and put back a tiddler. Fortunately the competitive streak amongst the group began to kick in and by day three the after dinner fishing trips had started. The gentle evening light is particularly good for the sport apparently as its harder for the fish to see you and not as some think because they are feeding as they do not eat while back in the river. My previous postcard Quite the Catch explains more about the wild salmon’s incredible life and journeys from river bed to ocean and back. 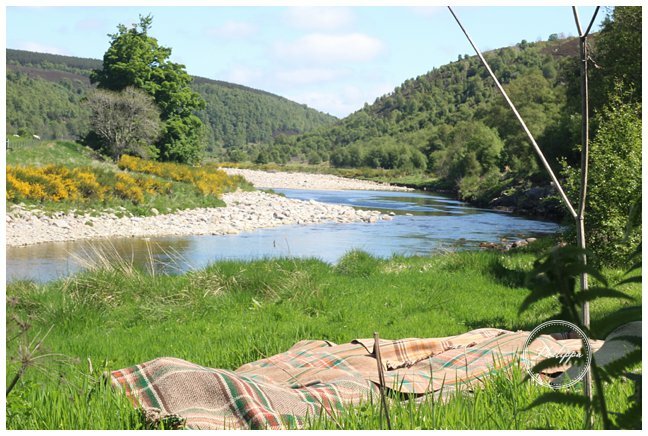 This year on the Findhorn river there is a 70 % catch and release policy with anything caught over 9 lb, basically meaning you need to catch two over 9 lb before you can keep one, which also basically meant they had to get their fingers (rods) out. Day four after breakfast the trail of 4 x4’s headed off to their various beats ( sections of river they can fish) and I was on red alert as we had all agreed, today must be the day. The tradition is to beep the horn of your vehicle as you return to the lodge if you have been successful, so my ears spent all morning being as pricked as a spaniel’s. The horn was also the signal for those in the group already back to dash out with a wee dram ( it was G and T’s if you returned empty netted so a pretty win-win situation if you ask me). I am delighted to report that during the second half of the week the wild salmon became more compliant and so the horns more frequent. 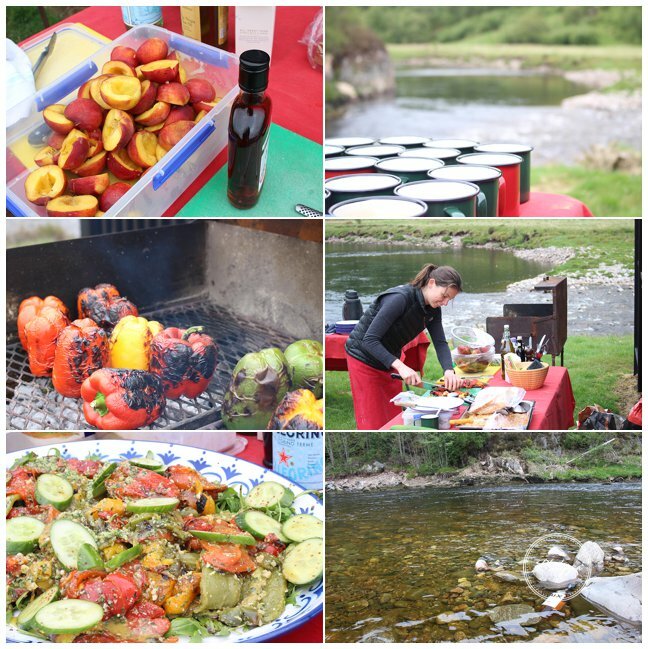 The weather too also started to play ball and created perfect conditions for BBQ lunches on the river bank. Relatively obsessed (ok, totally), with BBQ s from my years as a chef at Moro restaurant where I fiercely fought off all the boy chefs from the charcoal pit I have firmed up some strong opinions about how to properly grill as well as tips and techniques. Cooking BBQ s on river banks in Scotland has also perfected my skills at lightening them up as bursts of wind and rain are not uncommon. I confess one weather challenged day 2 packs of firelighters and the entire Sunday Times were invaluable. At this point ,with summer coming up, I would like to take this opportunity to say my main concern if ever asked to go and cook a BBQ for a client is when they lead me down the garden path and unveil…the gas fuelled beast. My views are if you are planning a BBQ and have a gas one, don’t bother. You are better off just cooking inside. Gas adds very little in terms of flavour to your meal and they rarely stay hot enough, even the really expensive ones and believe me I know. Swiftly moving on ( and off my very high horse) with BBQs now on the agenda my days were anything but relaxed but were certainly a lot of fun. Balancing breakfast cook and clear up with lunch prep and packing it was a fast and furious start to the day. Once the trusty Range Rover was loaded chock-a-block with food, drinks, tables, charcoal and fire lighters I headed to the assigned fishing hut. Upon arrival at the chosen bucolic spot the boxes and kit were unloaded, a makeshift outdoor kitchen erected, the table laid, BBQ lit and the final bits of prep started before the hungry and often slightly chilled fisherman began to surface. 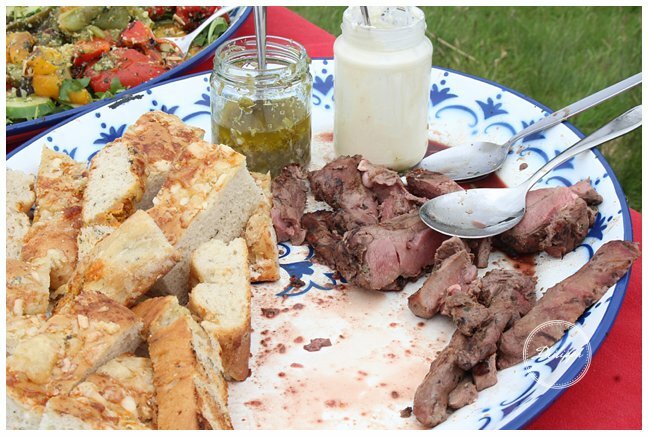 They would be welcomed with a tin cup of warming home made soup then the grill themed lunch would follow. 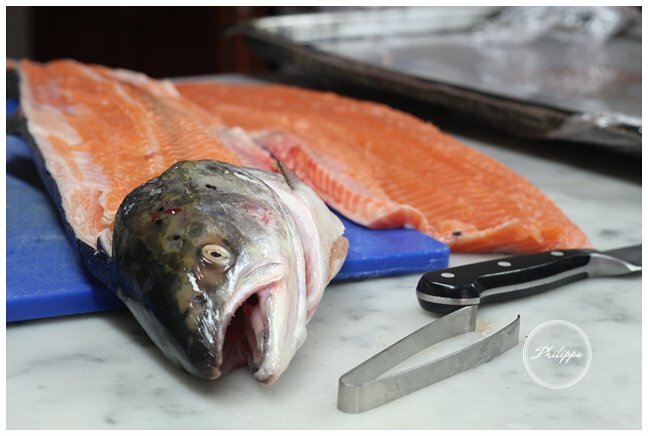 Over the week they had fillets and legs of estate venison, grilled crispy skinned chicken, pork chops, whole bass, bream, squid and of course wild salmon. I feel sauces are always important as you generally don’t create much gravy / juice with this method of cooking so jars of fresh horseradish, salsa verde, chilli sauce, home made mayonnaise and tartar sauce made a fair few appearances. One of my favourite foods I cooked over the week, that came a close second to the grilled and whole foil baked salmon was the fresh flatbreads, that helped make ‘posh’ kebabs. 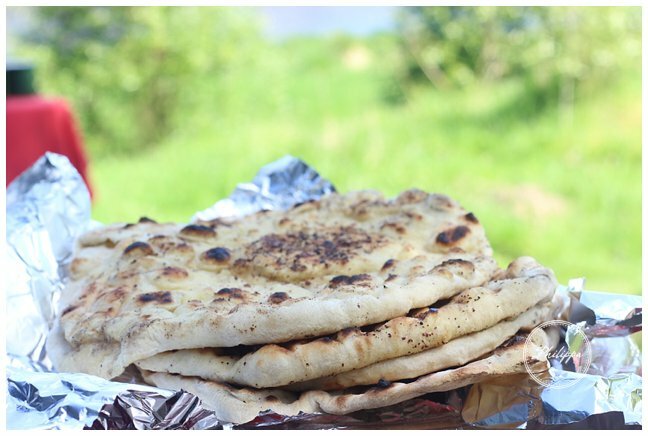 Home made flatbreads at a BBQ is pretty much a must for me as not only is it a fun activity that a few people can get involved with but they are also the perfect vehicle for grilled fish meat, veg and sauces so I have made them this weeks postcard recipe. Every home should have: access to a few beats ( and I don’t mean a ghetto blaster). 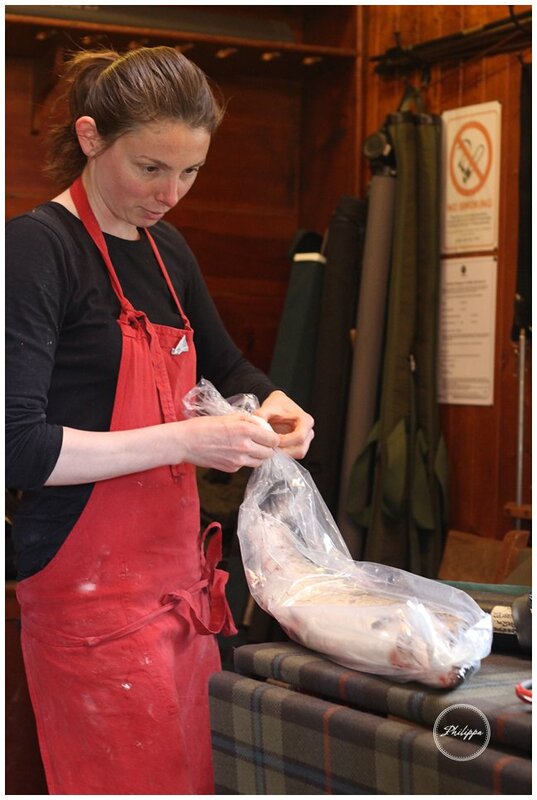 I learnt : You can tell a Findhorn salmon as they are the prettiest ( possibly source slightly biased). You can knead and rest the dough then transport it to the riverbank / bbq to grill in a bowl with some lightly oil cling film on top. 2)In a jug stir the yeast into 300ml of the water with the honey, leave for 5 minutes (it should have started to foam) then pour into the flour and start to mix. 3)Add the olive oil and yogurt and knead on a clean surface for about 10 minutes. The dough should be quite wet so if it feels stiff add a little more warm water. 4)When smooth and elastic place it back in the bowl, cover with a tea towel and leave to double in size, this will take about an hour in a warm kitchen. 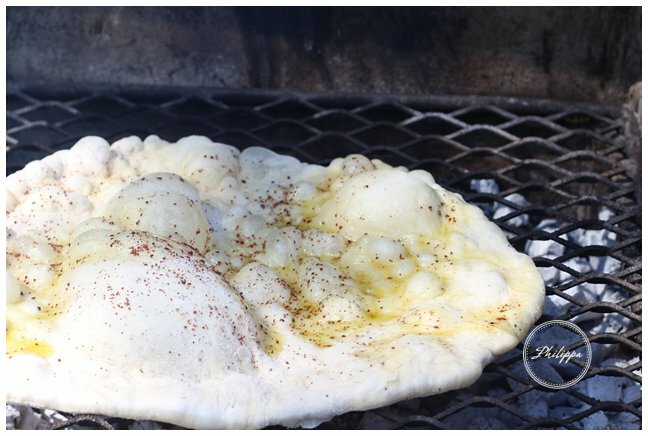 5)To roll the flatbread make sure you have a hot clean grill. Roll all the dough into equal sized balls (in-between a golf and a tennis ball is good). 6)Lightly flour your work surface and one by one roll the balls into circles or ovals about 2 – 3 mm thick. Lightly brush one side with olive oil and then scatter on your choice of sprinkle ( my current favourite is sumac mixed with ground cumin). 7)Grill on both sides on a high heat for a couple of minutes till golden. Serve as soon as possible. If doing a batch you can lightly wrap them in foil and give them a quick flash on the bbq to warm them up. These are delicious with juicy grilled meats, vegetables or fish or with dipping sauced like labneh, hummus, salsa verde ect. 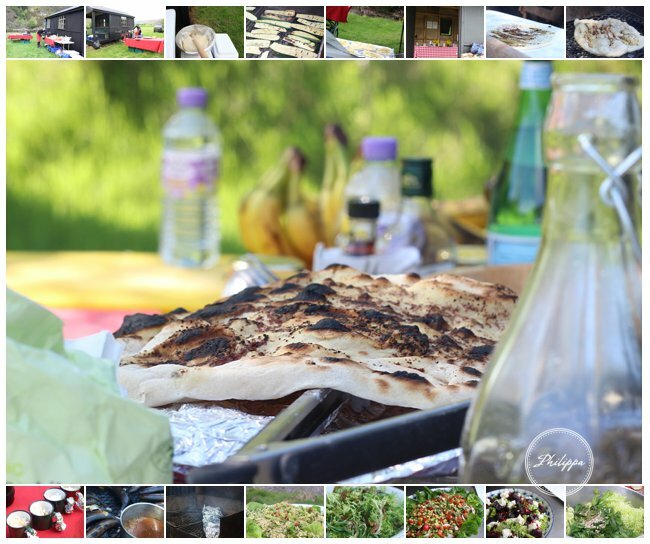 Next stop…cooking for a group cycling the Pyrenees.